Put Your Faith Into Action this Thanksgiving! Our next Faith In Action Day is coming up this Saturday Nov. 21st. We will mobilize a small army to head out into our community to serve in real, practical, & tangible ways. This is the model Jesus gave us – meet people’s physical needs & then the door is thrown wide open to begin meeting their spiritual needs. What a great way to demonstrate what Jesus is ALL about – by GOING, DOING, & BEING what Jesus has commanded us to. 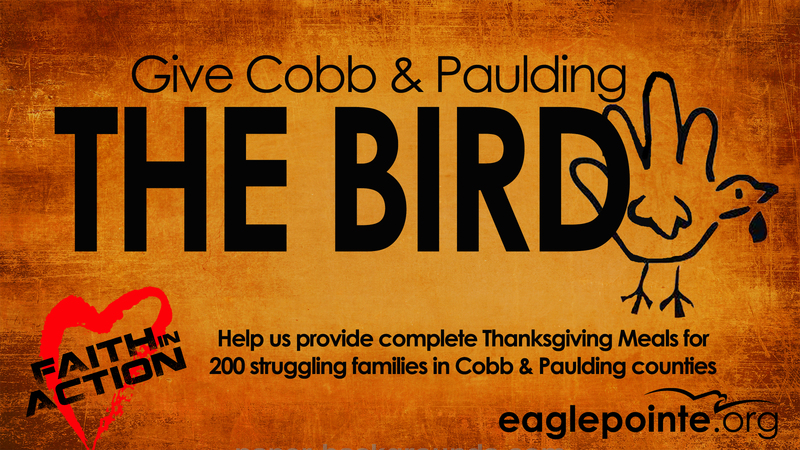 Make plane to join us for a morning of serving – doing Christmas decorating & baking at a Children’s home, doing Christmas decorating inside & outside our church, & putting together and delivering complete Thanksgiving meals for 180 struggling families, single moms, etc in our area with our #GiveCobb&PauldingTheBird. In, addition to YOU joining us for Faith in Action – I hope that you will invite your friends, neighbors, & co-workers to come join you. Get them involved in helping others & making a difference in our community. A church doing this kind of thing does not compute for most people & blows them away. Who knows? Maybe this is the kind of thing that will resonate with those you know who are disconnected from God & His church. Maybe this will “change the way THEY think about church” & help them get connected. Give it a try! We ask that you arrive at your location no later than 8:45AM (you won’t hurt our feelings if you’re early). At 8:45AM each location will have a group meeting & prayer time before starting to work. ***FYI: We will not be offering childcare during Faith in Action. You are welcome to bring young kids to the Children’s Home & to the Preparing Turkey Meals. I look forward to seeing all of you at Faith In Action Day – it is going to be an amazing day of God working in so many lives! Every month we have an amazing crew of Eagle Pointe’rs who go out & serve meals to the homeless in our area. Now that we are heading into the winter months we want to help our homeless friends survive the bitter cold. Fortunately, most of us will never know what it is like to sleep in the freezing cold with virtually nothing to keep us warm. Help us put together 100 Winter Survival Kits for the Homeless. While we still need some adult jackets – here is what we need a BUNCH of… Gloves, hats, scarves, ponchos, handwarmers, tissue packs, toilet paper, toothbrushes, toothpaste, chapstick, zip lock bags, AA & AAA batteries, candles, thermal underwear, soap & shampoo. We will distribute these items out at our Homeless Feeding on Sat. Dec. 6th. Please help us round up these supplies to help our homeless friends survive the cold winter. Get your friends & co-workers involved. On the morning of Sat. Dec. 5th we will meet to organize & pack all of the supplies into tote bags. Then that afternoon, while we are serving meals, we will be distributing the Winter Survival Kits. If you are interested in helping on Dec. 5, or any other time we are serving meals, please contact Scott Nations. 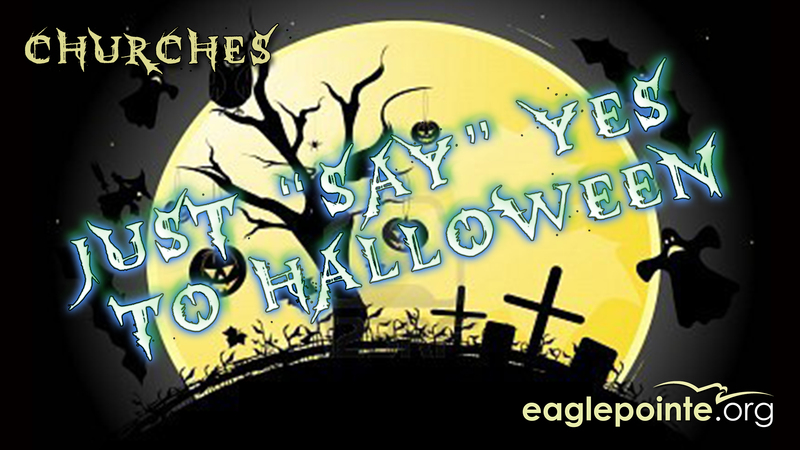 Churches/Christians – Just say “Yes” to Halloween!!! Many of us have grown up hearing a very wide-range of views relating to Halloween – especially from Christians & Churches. Please take a minute & read this post & watch the videos below to see how we view & “use” Halloween, in some very fun ways, to reach people for Jesus. Being that we have so many people coming to Eagle Pointe from all different church backgrounds & no church backgrounds – I get asked quite often around this time of year – “What is your’s & the church’s view of Halloween?” This question comes up a lot especially since our church does a huge pumpkin patch, as well as, student ministry costume party & an event for families in our community called “Trick-or-Treat Street”. I always love this question because I never know what that person’s view is or how they will respond to my view. 1) Yes – Halloween started out thousands of years ago as a Celtic celebration steeped in witchcraft – but that certainly is not what 99% of people equate it with today. For most, it is an excuse to dress up, be silly, & have fun. 3) I propose we (Christians) hijack Halloween! 5) There is no other day of the year that almost every one of my neighbors are coming to my front door!!! (think about it) SO – I’m camping out on my front porch with a huge bowl of candy, thermos of coffee for the adults, & invite cards to my church!!! Let the hijacking begin! 6) As for our “Trick-or-Treat Street” – What a great opportunity to reach out to the families in our community, give them a great, fun, & safe family experience (they’re going trick-or-treating anyways), & let them know about what God is doing here at Eagle Pointe. We have theme rooms set up, about 40 characters for kids & families to get their pictures taken with, & giving out A BUNCH of candy to the kids, & invites to church. We had a few hundred families come through Trick-or-Treat Street last year. Let the hijacking begin! 7) For me – Halloween is a great excuse for me to go pillage & plunder my neighborhood for candy with my kids! 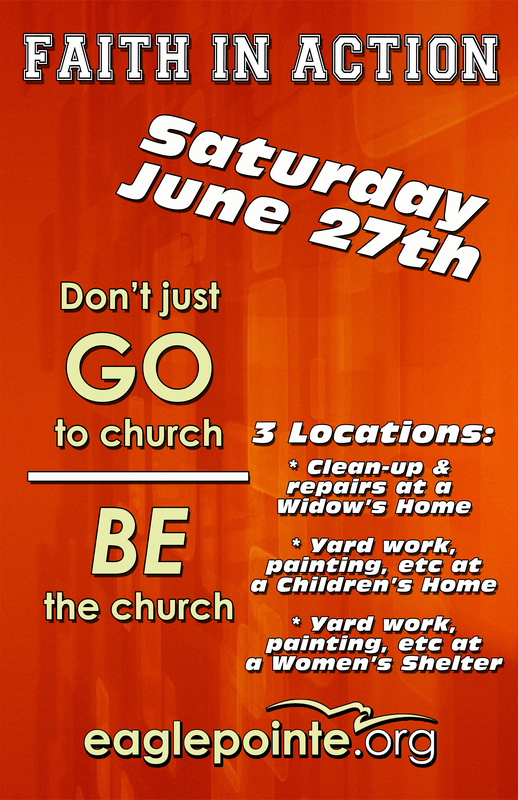 I cannot wait for this day when we have a bunch of people working at a Children’s Home near red top mountain, doing a mini-home improvement makeover for a Widow in our area, working at a Women’s Shelter in Marietta. We will mobilize a small army to head out into our community to serve in real, practical, & tangible ways. This is the model Jesus gave us – meet people’s physical needs & then the door is thrown wide open to begin meeting their spiritual needs. What a great way to demonstrate what Jesus is ALL about – by GOING, DOING, & BEING what Jesus has commanded us to. In, addition to YOU joining us for Faith in Action Day – I hope that you will invite your friends, neighbors, & co-workers to come join you. Get them involved in helping others & making a difference in our community. A church doing this kind of thing does not compute for most people & blows them away. Who knows? Maybe this is the kind of thing that will resonate with those you know who are disconnected from God & His church. Maybe this will “change the way THEY think about church” & help them get connected. Give it a try! Below is a list of our Faith in Action locations, as well as, a link you can click for a “project info sheet” for each location. These sheets explain the work being done, what you can bring, directions of where to go, etc. Please be sure to get the info for your location & please contact the project coordinator for the location you would like to serve at RIGHT AWAY – so we know how many people we have to work with & how many projects we can tackle. BTW: We do this twice a year & the next one will be at Thanksgiving time. 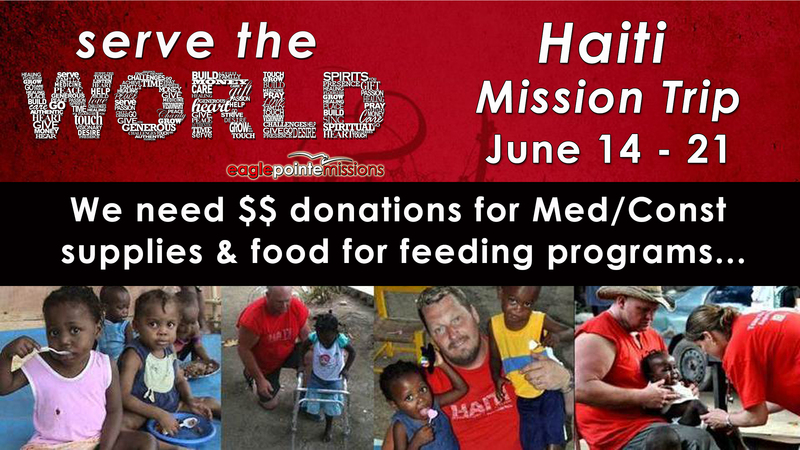 We will have a mission team heading back to Haiti June 14 – 21. We will run a free clinic for the week seeing 400+ families a day. We will also be providing medical care at 2 orphanages. In addition, we will be doing some construction projects at a local church, as well as, building homes around the local community. And we need your help to pull this off! Below is a list of supplies needed for our Haiti mission trip. As well, there is also a list of the money for projects we need to fund-raise between now & then. PLEASE help us round up these supplies & donations. 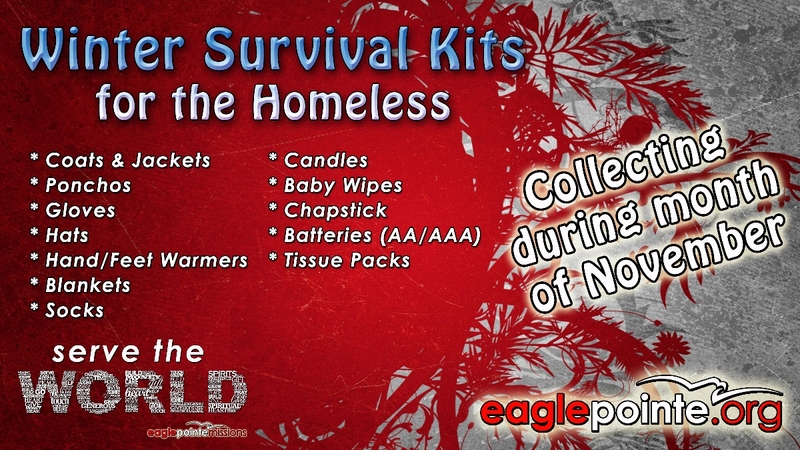 We need supplies dropped off at Eagle Pointe by Sunday June 7th – so we can pack everything up & have it ready to go.